Is it me, or is USD/CHF about to retest its long-term triangle resistance again? Is the nth time the charm for the bulls? As you can see, the pair is a hair’s breadth away from the 1.0050 level that has been serving as resistance for almost TWO YEARS. Talk about commitment for the bears! What’s more interesting about the setup is that we’re also looking at an ascending triangle. And, because it’s been building up since last year, an upside breakout will likely be a strong one. We’re talking 800 pips or so! It’s certainly easy to be on the dollar’s side these days. For one thing, U.S. Trade Representative Robert Lighthizer and Treasury Secretary Steven Mnuchin are set to visit Beijing as early as this weekend to talk trade. If Lighthizer and Mnuchin make significant progress in Beijing, then we’ll avoid the continuation of a steep trade war between the world’s two largest economies on March 2. In the meantime, optimism over the meeting could keep market bulls away from safe havens like the franc. For now, I’ll be on the lookout for USD/CHF’s reaction to a (potential) retest of the 1.0050 resistance. If a weekly candle closes convincingly above the level, then I’ll be getting my long trades ready. But if it’s looking like the bears are willing and able to defend 1.0050 for another day, then I might look for another entry around the rising trend line instead. What do you think? 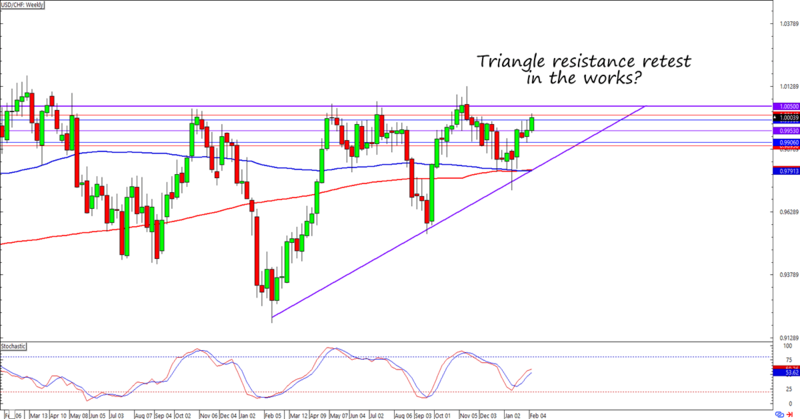 Will we see a triangle resistance retest within the week?